Boca Raton Riviera is an exclusive, beachside community located on the east side of the Intracoastal Waterway in the heart of Boca Raton, FL. A true mariner's paradise, many of the luxurious homes in Boca Raton Riviera offer private deep water docks accommodating up to 100-foot vessels. Just minutes from the Boca Inlet and with no fixed bridges, residents of Boca Riviera enjoy easy access to the Atlantic Ocean, as well as the best in fishing, snorkeling, sailing, and other exciting water-based activities. great location just one block and a half to the beach. Near shoppig areas, MiznerPark and more. Nice clean unit, steps away from the beach. Great location, walk to Palmetto shops, and short drive to Mizner Park and great restaurants. Situated on the spectacular Intracoastal waterfront, Boca Raton Riviera homes boast incredible views of the Intracoastal Waterway and its deep water canals, as well as the gorgeous surrounding tropical landscape. Boca Riviera homes are nestled in a "No Wake" zone, thereby adding to the already-prevalent peaceful tranquility of this picturesque waterfront community. Additionally, I-95 is conveniently close to the community, offering residents easy access to Miami, West Palm Beach, and Ft. Lauderdale airports. With the perfect year-round weather, breathtaking surroundings, and an amazing downtown/waterfront/beachside location, Boca Raton Riviera offers the ultimate in luxurious waterfront living in Boca Raton. If you think Boca Raton Riviera is the perfect place for your private waterfront retreat, you may want to visit similar waterfront communities in Boca Raton including Sun & Surf and Spanish River Land, both of which also offer luxurious homes East of the Intracoastal Waterway in Boca Raton, FL. If you are interested in purchasing a home in Boca Raton Riviera or would like to learn more about homes for sale in other Boca Raton communities, please call us at 561-998-9015. You may also reach us by completing the simple online contact form provided below. 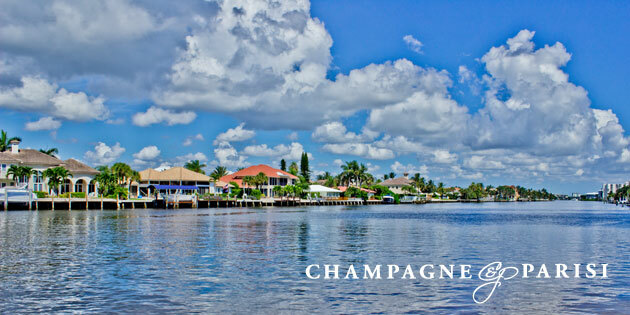 We at Champagne & Parisi Real Estate look forward to assisting you in finding your dream home in always sunny Boca Raton, FL! Click here for a complete list of all developments in Boca Raton.